Profuse sweating, drenched clothes, nausea, and a numbing headache quickly followed by chills - it's not the tagline for a horror movie, but a common reality for many women over 40 suffering from the discomfort of hot flashes. Usually, right after a hot flash, the skin is left reddened and clammy. To help prevent these uncomfortable episodes, many healthcare professionals recommend making a few simple dietary changes. Soy contains two important compounds: genistein and daidzein. These edible and highly regarded beans are estrogenic, which means that they simulate the effects of estrogen in your body to compensate for its loss. This means that soy can help control hot flashes and other menopausal symptoms. Eggs contain vitamin B, which plays an important role in stabilizing the function of the adrenal gland. This is essential in helping to reduce hot flashes by promoting estrogen and progesterone balance, which can reduce the chance of a hot flash. Eggs also contain protein, iron, and zinc, all important for your health. Besides adding flavor and color to any meal, fruits and vegetables such as apples, bananas, cabbage, and broccoli also contain a healthy amount of fiber, and can assist in eliminating hot flashes completely. People who eat lots of fruits and vegetables have a lower risk of heart disease, stroke, and some kinds of cancer. Whole grains such as barley, oatmeal, and brown rice are beneficial in preventing hot flashes. Dietary fiber is a primary component in helping to restore correct estrogen levels in premenopausal women. You can also try eating potatoes (they're better with the skin on) to get your necessary starch. Drinking extra water will replace any fluids lost due to excessive perspiring, and can even help to prevent or minimize their occurrence. Experts recommend drinking at least half a gallon of water daily. It's also important to avoid certain foods. 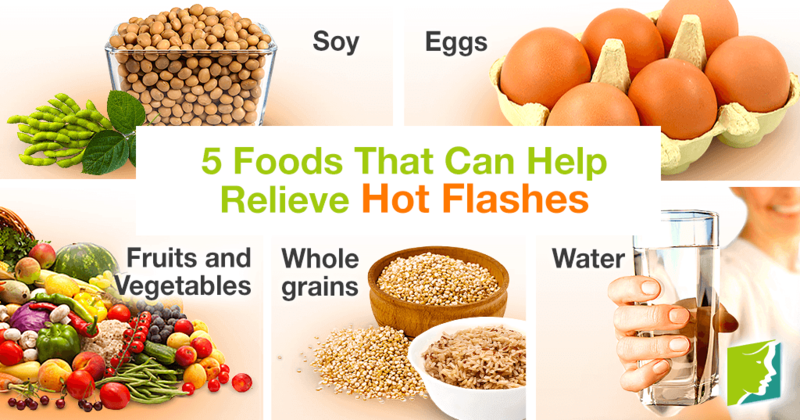 Dairy products, meat, and spicy foods rank among the top triggers of severe hot flashes. In addition they can create hormonal imbalance, leading to mood swings. Alcohol and caffeine also lead to hot flash flare ups since they can strain the liver and increase acid in the blood. Cut down on these types of drinks and consume more fresh vegetable juice. By changing a few dietary habits, hot flashes will become a thing of the past. Click to find more information about treatments for hot flashes. Hot Flashes in Young Women: Is it Early Menopause?